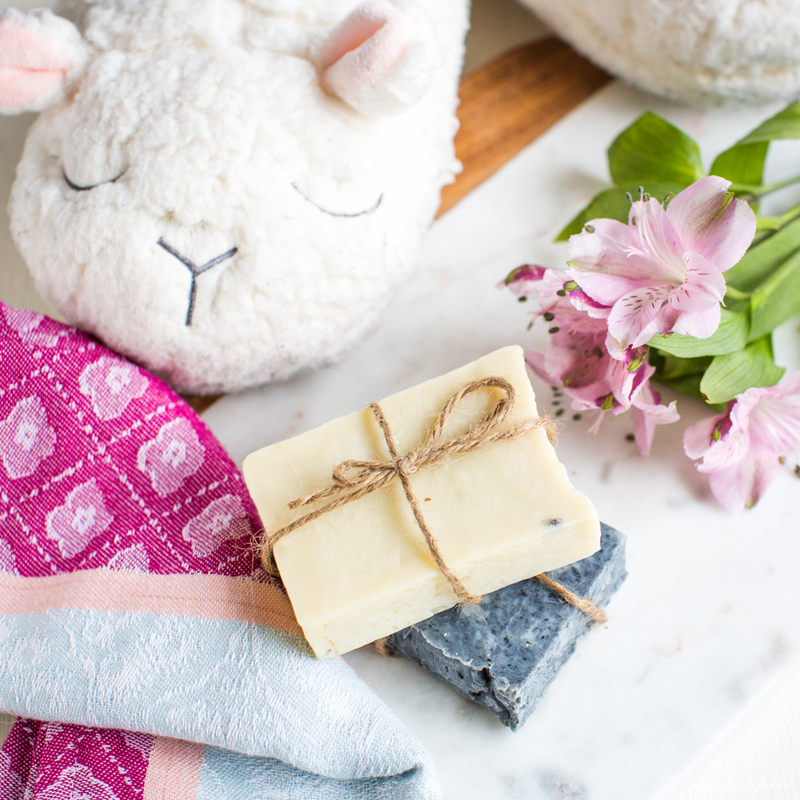 You Are Here: Home → 15 Conscious Vegan Gift Ideas That Everyone Will Love! Are you on the hunt for the perfect gift? Something that warms the heart of a loved one while also aligning with your ethical standards? Well, you’ve come to the right place. 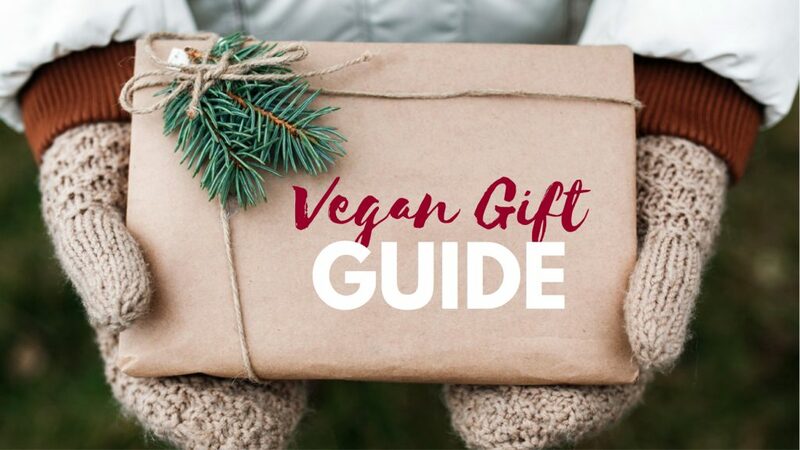 You’ll find lots of conscious vegan gift ideas below, including many budget-friendly options! Of course, don’t forget the best gift of all—time spent with your loved ones. You absolutely don’t need to give people gifts to show them you love them. You can invite them over for a home-cooked meal, write them a thoughtful card letting them know how much they mean to you, or just give them a big hug and tell them in person how grateful you are to have them in your life. My hubby and I stopped giving each other tangible holiday gifts years ago. The holiday gift-giving season started to feel really excessive and wasteful to us, so we decided that we’d find new ways to spend time together instead. It doesn’t take long to discover that the best gifts don’t come wrapped in paper. That all said, I know you’re here for actual vegan gift ideas that you can tie a ribbon around. So, here are some that I’ve found will actually be used, loved, and not discarded soon after they’re opened. Enjoy! 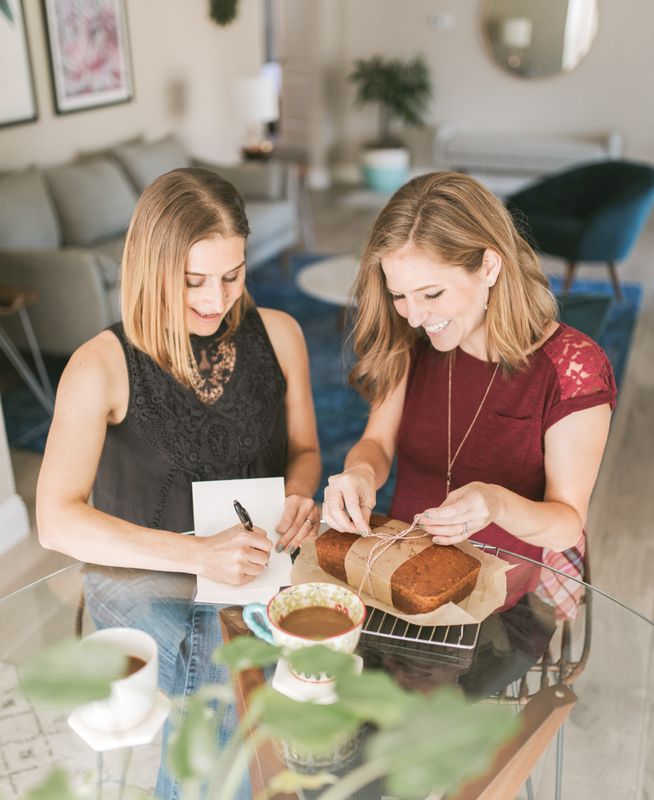 Instead of buying more stuff, why not bake something you know your friend will love? These sugar cookies are a great choice because you can easily customize them by using your favorite cookie cutters and unique frosting designs. Make it extra special by wrapping them up with a fun cookie cutter and including the cookie recipe in the card! 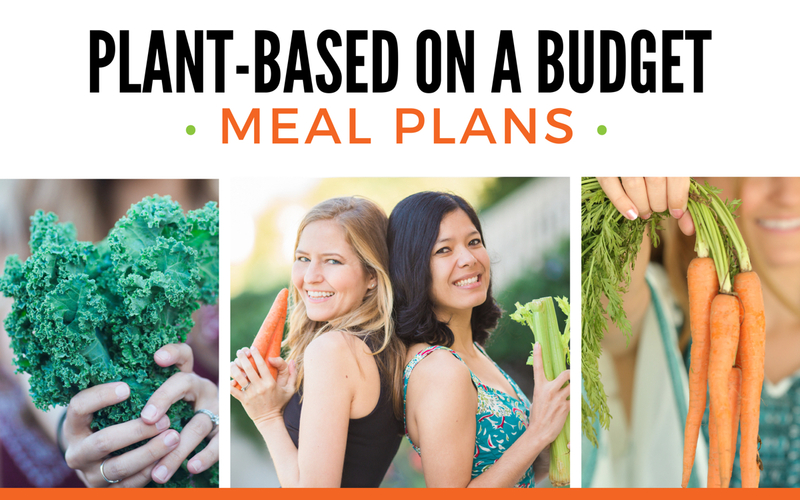 Your friends certainly don’t need to be vegan to enjoy a brand-new copy of your favorite cookbook! Make it extra-special by including a little note highlighting your go-to recipes from the book that you think they’ll love. This is my personal favorite cookbook that I’ve gifted to many of my family members and friends over the years. The spinach artichoke dip and stuffed shells are to die for. Toni got me these socks for Hanukkah this year and I instantly dug my toes down into them and never ever wanted to take them off. I’ve been living in them. I had a similar pair last year that I wore so often that they got big holes in the bottoms (which I suppose is why Toni knew this would be the perfect gift for me)! Get these for everyone you know—they’re sure to love them. If you have a crafty friend who likes to bake, you can gift them some unique new cookie cutters! 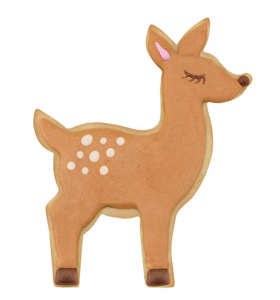 Seriously, how cute are these woodland creature cookies? Oh my gawd, need. This traditional gift idea never gets old—especially when you find a candle that’s naturally scented and ethically made from soy wax! Your loved one will think of you every time they light it. Scent is the strongest sense tied to memory, after all! I think we’re all eager to move away from conventional, chemical laden, plastic-packaged bath and body care products. While some items like shampoo are quite personal, I imagine anyone would be grateful for a high-quality natural soap. Just make sure it’s vegan—you wouldn’t believe some of the ingredients that can make their way into soap (like animal fat and milk)! If you avoid palm oil, note that it’s often the first ingredient in soap (sometimes listed as “sodium palmate”). That’s the case even with soaps that are natural and cruelty-free! Booda Organics makes palm-oil-free soap that would make a great stocking stuffer. Essential oils are all the rage right now—and for good reason. They’re relaxing, aromatherapeutic, and extremely useful for cleaning and sprucing up the home. I love putting a drop of lavender essential oil on my pillow at night and on my towels when they come out of the wash. I rub peppermint essential oil on my belly when I feel nauseous (try it—you’ll feel the cooling “tummy tingles” almost immediately). I use lemon essential oil in my homemade household cleaning solutions and when I’m scrubbing the sink or the floors. And I add all sorts of essential oil blends into my diffuser when I want to freshen up a room. A nice gift pack of the most popular essential oils would make a great gift for both newbies and super-users! Lavender, lemon and peppermint are my top three faves (and the ones I run out of most often). No vegan gift guide would be complete without mention of vegan subscription boxes! 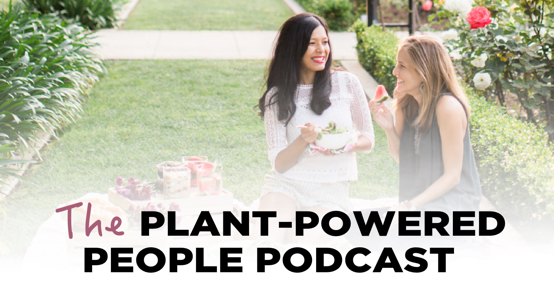 We have an entire vegan subscription box guide outlining many of the options out there. 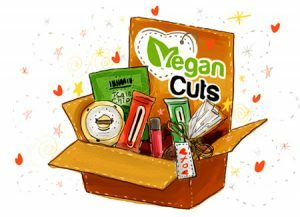 The popular Vegan Cuts Snack Box, Vegan Cuts Beauty Box, and quarterly Vegan Cuts Makeup Box are great options for the snackaholics and makeup lovers in your life. You can have them shipped to their doorstep every month so the joy will extend far past the holidays. If someone on your gift list loves to cook or is trying to eat healthier, a produce subscription box would make an amazing gift! 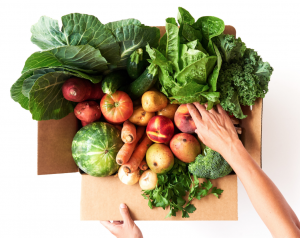 Companies like Imperfect Produce and Farm Fresh to You deliver boxes of fresh produce right to your doorstep. I’ve used both and love them—it’s a great way to support farmers more directly and also inspire more creativity in the kitchen. I just got some of these silicone reusable bags for food storage and love them! I’ve always hated throwing single-use plastic bags in the trash so I recently got into a practice of washing out my used flimsy plastic sandwich bags and hanging them up to dry (so I could use them a few more times). My hubby must have thought I was losing it. These silicone bags are game-changers. They’re meant to be reused again and again forever and they’re dishwasher-friendly. It’s the kind of thing you can’t ever have enough of. Plus, they’re pricey which makes them a great gift—something you might not splurge on for yourself but would so appreciate receiving! I can’t tell you how many times I’ve gone to a restaurant and had a big pile of leftovers. I always want to take my leftovers home because—well, food waste stinks! And you know I’ll be digging into those leftovers in a few hours. But I hate, hate, hate that most restaurants have but one option: styrofoam take-a-way containers. Styrofoam can’t be recycled and essentially never biodegrades, So to use it for something that will be carried home once and then thrown away forever irks me to my core. That’s why I’ve been wanting one of these for ages but haven’t gotten it because they’re a little pricey. I think this would make a great practical gift for anyone eco-minded! They can keep it in the car so whenever they’re at a restaurant, they can say “pass” to the styrofoam containers and go grab their stainless steel bento box instead. For the special guy in your life, how about a collection of some of your favorite cruelty-free men’s grooming products? 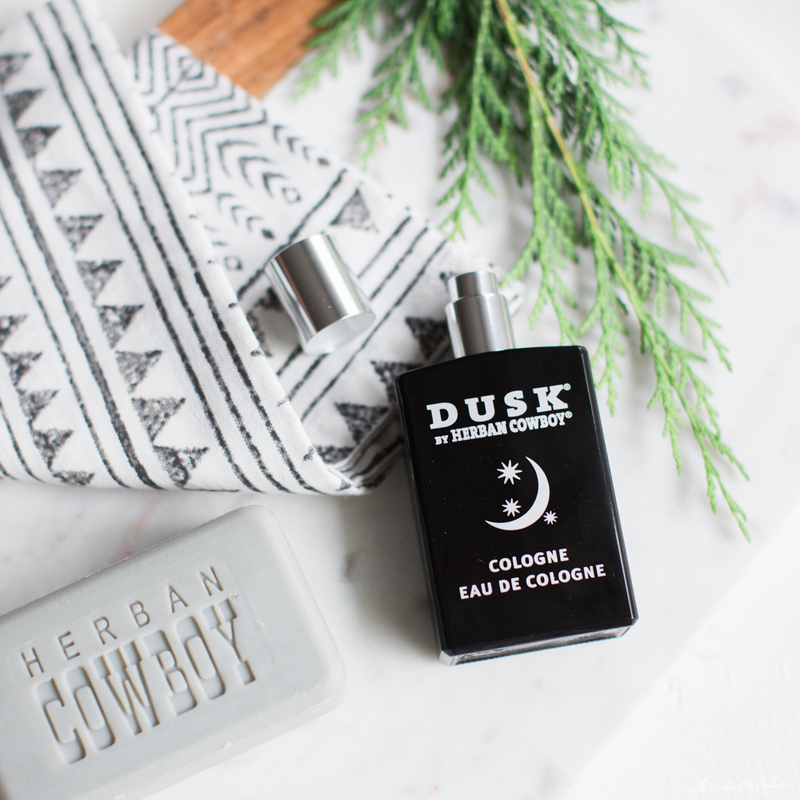 Herban Cowboy is one of my hubby’s faves—they’re a fully vegan brand and he uses their soap and deodorant all the time! 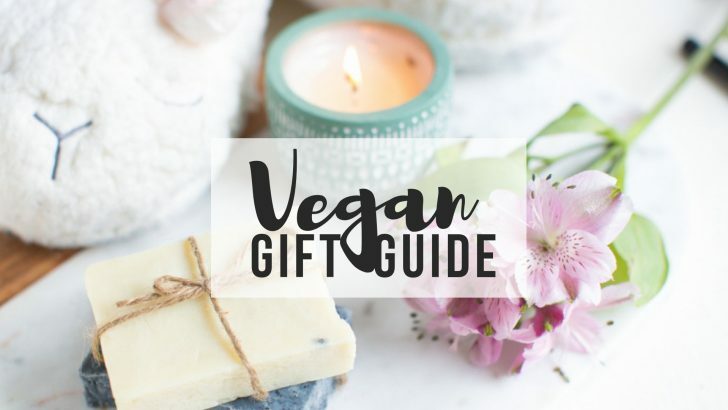 There are tons of vegan brands that offer beautiful gift sets, especially around the holidays. Some of my favorites are from Pacifica. 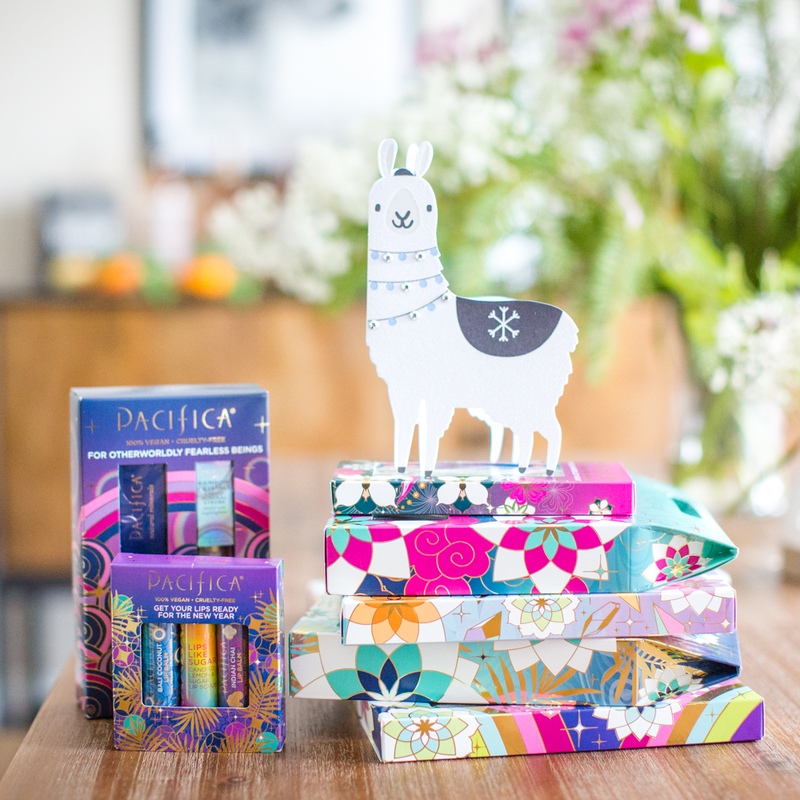 Their packaging is stunning—so bright and fun for the holiday season. You can also check out Booda Organics, Natural Vegan, Lush (most products are vegan but not all), 100% Pure (most products are vegan but not all), and more for those in your life who could use some pampering. I used to think that a well-equipped kitchen had to have an entire collection of knives—a knife to fit every need. I was mistaken. A single high-quality well-cared-for chef’s knife should cover 95% of your food prep needs. One solid chef’s knife and one serrated bread knife, and you’re good to go. Minimalism, baby! Unfortunately, good quality chef’s knives are quite expensive, which is why I’ve put off getting one for years. I know I’m not alone, so if you know someone who spends time in the kitchen but hasn’t “treated themselves” to a proper knife, a chef’s knife like this one would certainly be a cherished gift! Just make sure you let them know it’s super-high-quality so they know to take care of it! 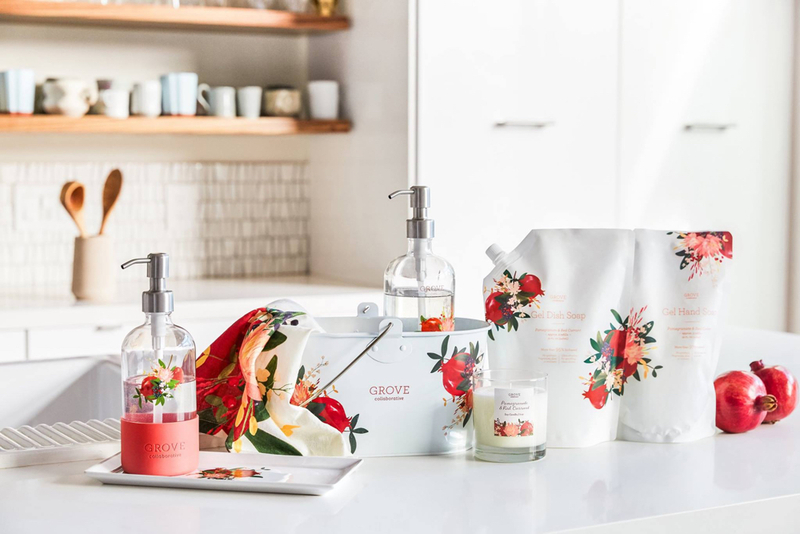 I recently discovered Grove Collaborative and I’m a little obsessed. In my first order I got a bunch of glass soap dispensers and spray bottles to replace all the plastic disposable cleaning products in my home. It feels so good to be stepping up my eco-conscious game in this way, and with this gift you can help someone you know feel the same. Did you know that most wrapping paper is not recyclable? Instead of turning to that glossy, sparkling paper that will be immediately discarded in the trash, why not go for recycled, biodegradable, eco-friendly wrapping paper? Don’t worry, you won’t have to sacrifice the festive look of your gifts. You can decorate simple natural wrapping paper with some winter tree leaves (extra points if you pick them outside!) and twine. Hungry for more gift ideas? Check out our Luxury Vegan Gift Guide! 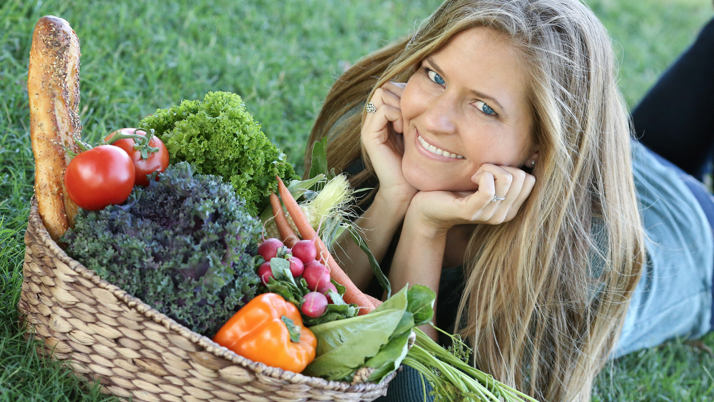 This article contains affiliate links, and shopping through these links supports World of Vegan. 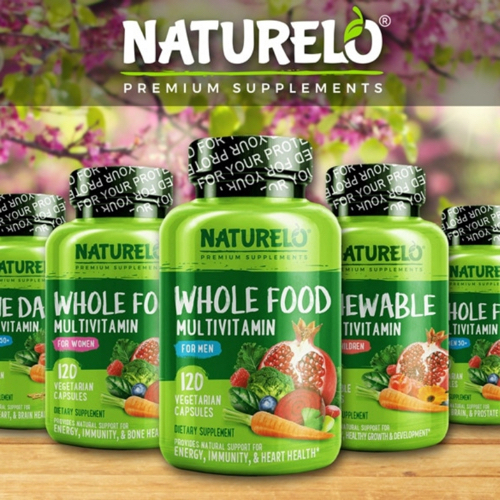 This article is not sponsored, and we only share products and companies we sincerely adore!